Why should early motherhood be so hard? What images come to mind when I say the word “postpartum”? Do you feel tension or expansion in your body at the mention of that word? 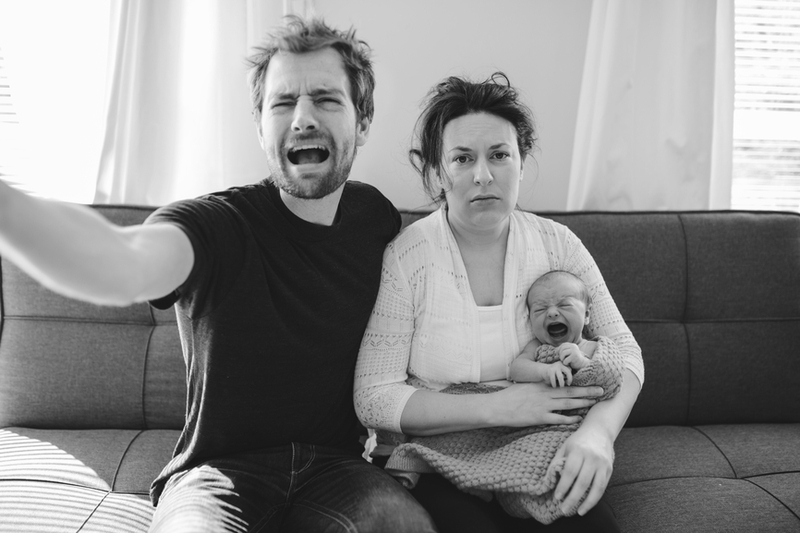 My hunch is that you had a vision of this trio above: disheveled and painfully sleep-deprived parents and an inscrutable crying baby. When you read “postpartum,” your mind might have supplied the word that often accompanies it: depression. You likely felt a contraction in your body – maybe your gut tightened and you made a face. Surely it hasn’t always been. The story of evolution is survival of the species. It isn’t a perfect mechanism, but it doesn’t make sense for human mothers to be greatly weakened by the demands of early motherhood when their infants are completely dependent on them for their survival. What would help a newborn mammal in nature to thrive? Are you visualizing a gorilla infant clinging to his mother’s back? A marsupial baby in her mother’s pouch? A box of kittens being warmed and fed by their mother, who leaves them only briefly the first days after birth? What you’re visualizing is continual contact. Mammal babies rely on their mothers for food, warmth and protection, so they are best off when they are in skin-to-skin contact with their mothers. Continual contact keeps baby warm and happy. Physiologically, that translates into big gains for your little darling. According to Buckley, a stable, warm body temperature and low stress hormones reduce baby’s energy requirements; enhance digestion, healing and growth, and improve blood sugar levels. Furthermore, skin-to-skin contact triggers the release of oxytocin, the hormone of love and bonding, which “imprints calm and connection,” as well as making baby easier to soothe. The advantages of continual contact do not flow only to baby. As the name indicates, the benefits are mutual. Skin-to-skin touch with her baby triggers a cascade of beneficial hormones associated with health and successful mothering. Oxytocin deepens her affective bond and initiates the release of breast milk. Endorphins, the hormones of rest, recovery and bliss, are released with oxytocin. Prolactin not only feeds baby through the production of breast milk, it is the “hormone of surrender,” which helps the mother to relax and tolerate the monotony of newborn care. Continual contact, then, is the physiological foundation for mother-baby thriving. Not only does it promote health and healing, it feels good. So what gets in the way? In the ways that we do not fully support continual contact, we undermine mother-baby thriving. Our cultural values of independence and control come between mothers and their infants. When we talk about a mother “bouncing back” after baby and believe that holding “spoils” the baby, we insert independence where it doesn’t belong and raise a barrier to continual contact. When we encourage a mother to put her infant on a convenient feeding and sleeping schedule, particularly when she has to ignore her baby’s cries to do so, we insert control where it does not belong and raise a barrier to continual contact. Independence and control also work against a mother when it comes to asking for and receiving help in the early days and weeks after birth. Independence tells her she should be able to do everything on her own; if she cannot, she feels ashamed. Control tells her she should not allow others to see her when she’s a mess. The less help she has, the more likely she is to put baby down so she can get things done, inadvertently depriving both herself and baby of the generous rewards of mutual regulation. Now that we know how physiology works for mothers and babies, we know how to change our culture to support their thriving. Rather than giving them stuff, gift the new family the practical assistance that makes continual contact possible. Take them a hot meal, run errands for them, do a household chore, anything that enables the new mother to slow way down and concern herself – not forever, but for a while – only with her baby and their new life together.